I downloaded this on a complete whim and I'm so glad I did. I've been Netflix-binging all nine seasons of The X-Files in anticipation of their six-episode return to Fox in January, so sci-fi stories featuring aliens is sort of my thing right now. Fear the Sky was awesome. Just AWESOME. Earth is a prized commodity to the universe. It is one that in a very short period of time, millions of members of another race, an alien race, will come to take Earth from humans and use it for what they want. Without even wanting to take the opportunity to generate dialogue with humans, the plan is to come, take and destroy. Before this happens, alien reconnaissance is planned. With agents disguised as human, who supersede all human intelligence and technology, they infiltrate and learn and report back on potential challenges and plan the eventual destruction of all humans. When one man identifies an anomaly on a visual report of space, the partnership developed within a small but high-level group of people within the United States covering all areas from the military to the government begins, one that must be kept secret even from the President. After all, who would really believe that aliens were going to come to earth, or even that some were already here? 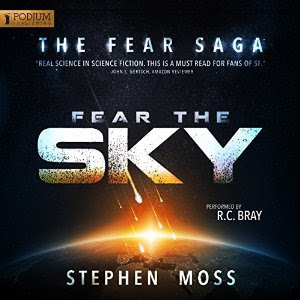 As this small team of devoted and dedicated patriots to the human race begin to investigate, plan, and ultimately defend, Fear the Sky becomes a powerhouse of a sci-fi story that I could not stop listening to. I wanted more - I wanted all of the trilogy released at once. It is a story a little heavier on the science and technical side than I'm used to, but it was a phenomenal story that I need more of. My only wish was that the word "ignominious" was used less. That's it. The reader was R.C. Bray, and we all know and love his work anyway. The link to the sample audio is here. FTC Disclosure: I downloaded this from Audible.com via my monthly membership fee. 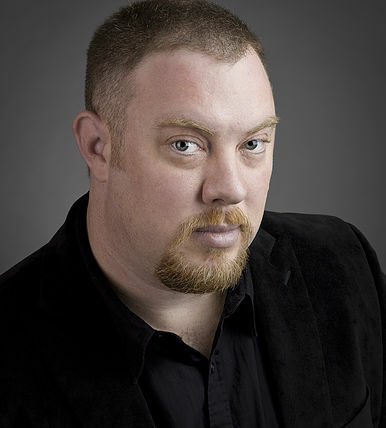 Stephen Moss was born in England, but spent time as a child in wildly diverse places, including several years in Brazil, Belgium, and Malaysia. He eventually settled in New York, but still travels avidly, something he uses as inspiration and input to his writing. 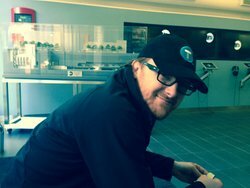 Stephen is a fan of Hard SF by masters such as Iain M. Banks, Peter F. Hamilton and Orson Scott Card and the many fantastic writers creating masterpieces every year. His first series, The Fear Saga, combines his passion for Hard Science Fiction with his passion for travel. The three-part series takes place across the globe, from London to Brussels, Africa to Antarctica, the Hindu Kush mountains to the back streets of Tel Aviv. The few places in the books which Stephen hasn't been to in person he researches avidly, wanting to put his characters into the reality of their surroundings, and knowing that the settings for a story are as important as the individuals you then paint into them. R.C. Bray is awesome and has narrated several books, but my favorite will always be The Martian. UPDATE [01/15/16]: An earlier version of this review incorrectly identified a different narrator for the work. This has been corrected - and my apologies for the error! Love the title Fear the Sky. Rarely read sci-fi but I should broaden my horizons and try something new!